If you are looking for the quality and rustic elegance of Amish made Oak furniture, Amish Originals Furniture Company is sure to have whatever it is you are seeking. If you are looking for Amish Oak furniture, you are already aware of the quality you can expect to find from this style of furniture. Not to mention, you can create a look and feel for your home that no other type of furniture can replicate. What you may not be aware of yet is how much variety you can find at our “one of a kind” original Amish furniture store in Ohio. When you shop at Amish Originals Furniture Company, you can choose the wood and finish for your pieces. From there, your selected pieces will actually be hand built to your specifications. You can take comfort in knowing that whatever room you are furnishing or piece you are specifically looking for, it can be crafted as Amish made Oak furniture. Browse a selection of bedroom, dining, patio and even kids’ furniture. Or maybe you are looking for items to complete your home office or home theater space. In that case you will love the variety we have available to you at our showroom or online collection. Even storage, display furniture and home décor can be part of what you choose from when you select your Amish made Oak furniture. The pieces we offer our customers are all handcrafted from the finest of American hardwoods. The wood used is kiln-dried lumber that is expertly and meticulously transformed into the final resulting furniture that makes the highest quality heirlooms. Whether you are looking for decorative pieces, functional furniture or a combination of both, rest assured we have it all at our store. The sawing, sanding, dovetailing and fitting that goes into each and every piece is a time honored tradition. You are not likely to find anything of this quality construction or resulting attractive look and finish anywhere else. Reproductions or knock offs are nowhere near the perfection you get from the construction and detailing that comes from human hands and not what you can get from machines. These skills are passed down through the generations, and you can, in fact, often find three generations of family members working side by side to create your furniture. 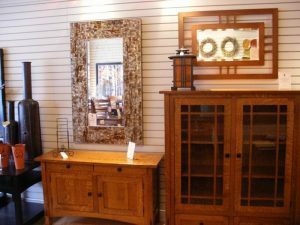 It’s reassuring to know we are able to offer you unprecedented and unbeatable quality Amish made Oak furniture. We also like to know we can provide you with the best selection possible too. We ensure this by working with more than 70 families from around the greater Northeast Ohio area. Since becoming established in 1992, we have been helping Ohio residents complete the look of their homes with the best furniture around. You know when you shop here you can get a single item or fill your entire home with Amish made Oak furniture. Visit us online at amishoriginals.com and sign up for our newsletter if you want product specials and updates.